The floods of 25 September, which devastated Rothbury and Morpeth, also caused misery at the mouth of the River Coquet with flooding in Warkworth and damage to boats in Amble Boat Club. 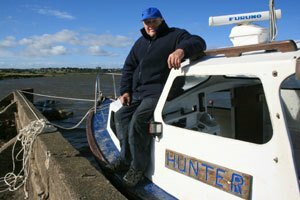 Alec Miller watched as a huge tree struck his boat ‘Hunter’, causing it to sink. At the same time the ‘Iona’, belonging to John Archbold was also sunk by floating trees. 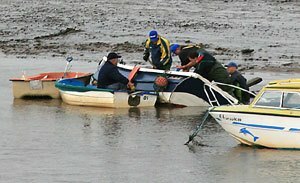 Together with fellow boat club members he was later able to dig the coble out and he now hopes to repair it. “The boat had quite a lot of sand in it,” he told The Ambler, “but after a lot of teamwork and brute strength, we managed to get it righted and on to the bank side. There was surprisingly little damage. All of the loose articles, oars, rudders and fleeces floated off, but amazingly they’ve all been recovered. The only things I’ve lost are a compass, a gearstick and a tarpaulin. So that’s not bad. When I saw her at 7am on the next morning and she was under the water, I thought I’d lost the whole boat.